Fresh garlic has an amazing aroma. I recommend always using fresh garlic. 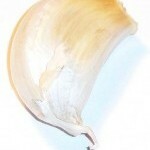 Simple flatten the garlic clove with the blade of a butcher knife applying a little pressure. This will separate the garlic from its shell and encourage the juices to come out. Garlic will spices up most of my beef cube steak recipes.